Black has always been a fashionable color. It exudes confidence and elegance. One might say it is also the secret color of success. A platinum dress watch on a shiny black strap, a luxurious limousine, the magic black credit card…all are understated even though they remain obvious status symbols. With GRIEB & BENZINGER`s new creation, the PHAROS CENTURION IMPERIAL, one more impressive status symbol arrives on the scene: a glamorous, yet simultaneously understated luxury timepiece boasting an all-black appearance. Its cool black look is perfectly topped off by an expressive, eye-catching pavé-set bezel with 66 black Princess-cut diamonds. The totally blackened manually wound movement with its signature three-quarter-plate is decorated in typical GRIEB & BENZINGER manner, particularly exhibiting its beauty from the back: hand-guilloché, hand-skeletonization, and hand-engraving as far as the eye can see. Like every GRIEB & BENZINGER creation, these watches are exceedingly rare; your neighbor isn’t likely to have one on his wrist. 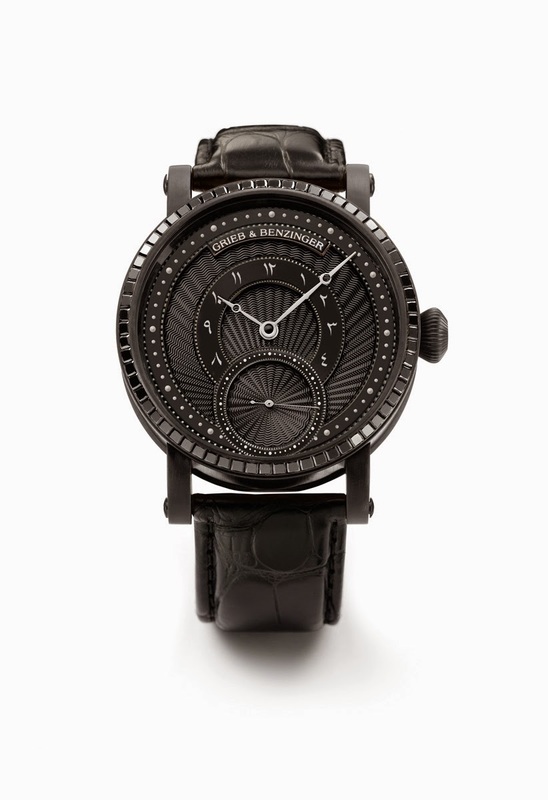 Blackened manually wound movement, three-quarter plate fully skeletonized, guilloché and engraved by hand. Solid, completely blackened PD950 palladium case, 43 mm in diameter, black alligator-skin strap, bezel set with 66 black Princess-cut diamonds.